Edited by Marie Page, BSPA, RN, CURN, this manual is intended for the use of operating room nurses and clinic nurses who assist with operative procedures in the "cysto" room. It also will be helpful for those studying for certification by explaining briefly the purpose for the procedures and supplies used, as well as providing an insight into some of the accessory equipment used. Equipment, supplies, and medications are discussed in generic terms. A set of laminated cards that contain the guidelines for each procedure that may be used in the cysto room is packaged with each book. 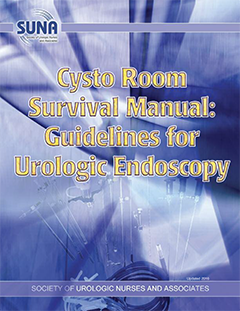 In addition to chapters on commonly used catheters in the OR, common cysto room medications, urologic specimens in the OR, cystoscope disinfection and sterilization guidelines and instruments, there are seven sections of cysto room procedures. These include Bladder, Ureteral, Urethral, Pediatric, and Stone Management Procedures.